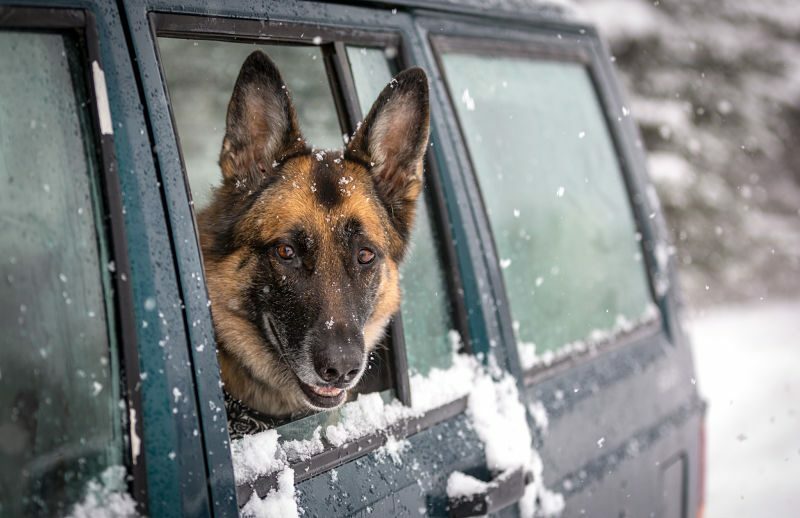 As we load up the car to venture over the river and through the woods to Grandmother’s house – or wherever holiday travel takes us this year – many of us will be bringing our pet along for the ride. While there are a variety of transportation options available from planes to trains, the easiest with an animal is often a car. Before traveling with a dog, we always like to remind pet parents that doing so poses certain limitations and challenges to a trip. For example, animals are not permitted in most restaurants, are restricted from many stores and even limited in what hotels you are able to stay at along the way. It is also important to keep in mind that you must budget time for regular bathroom, food and water stops. It is also important before leaving on a trip to make sure that your pet has a sturdy collar with an ID Tag and Rabies certificate attached. Be sure to consult with your vet to confirm that all vaccinations are up to date as well. It is wise to microchip your pet too in case they are separated from you and lose their collar. Have the dog groomed before leaving on the trip. This will help to keep shedding to a minimum in the car and at any places you take him during the trip. It will also help to reduce any unpleasant odors as you are in a small place together for an extended period of time. Place a beach towel or seat cover over any seats that your pet will be riding on. It will protect the surface from damage from paw nails and keep them fresh and clean should any human riders need to use those seats during your trip. Be sure to pack some favorite toys and a bed that smells like home. It will help to entertain your pet and give them a sense of familiarity to help with the anxiety of being outside of their normal environment. When ever the vehicle is in motion, make sure that they dog is either buckled in a canine seat belt harness or inside of a kennel that is anchored to the vehicle. This will keep the animal safe in the event of a crash or sudden braking. It will also keep all occupants of the vehicle safe be making sure that a dog eager to snuggle or play with the driver doesn’t cause a distraction or interfere with their hands or feet. Always keep your dog on a leash when stopping for bathroom breaks or to play. Roadside stops are full of danger from fast moving vehicles to strangers to other pets. Even with a well-trained dog, it is best to err on the side of caution. Dogs prone to stress often become especially anxious during travel. Comfort the animal by talking with them in a calm tone, provide structure and, if necessary, use a Calming Aid. Primo Pup Vet Health’s Calming Aid has a powerful blend of ingredients that help to relax an animal during travel. Never, ever leave a dog alone in a car. Cars can get very warm, very quickly and animals can die of heat injury fast, even on days that you would not expect. You also do not want to provide an opportunity for a dog to be stolen or to have the dog escape or your car damaged by a well-meaning good Samaritan who is interested in petting or “rescuing” your dog. Traveling with a dog offers challenges but can also be a rewarding way to experience a road trip. Just make sure you plan for the additional challenges that bringing an animal along present. Have a safe trip and a happy holiday!